Losing three goals to Coventry Blaze was "unacceptable" says Dundee Stars player-assistant coach Matt Marquardt. 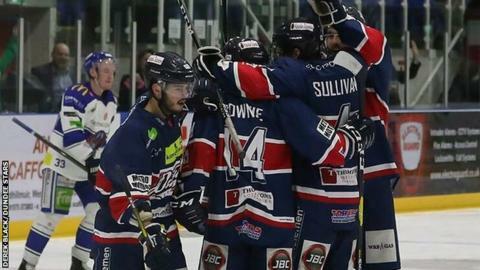 Despite losing 4-2 in Manchester on Saturday, they bounced back for only their second win in 10 as they edged past Coventry Blaze 4-3 on Sunday, coming from 3-1 behind. And while Marquardt was happy to see the character shine through, he says they need to stop "switching off". "We need to clean up in some areas," said Marquardt. Stars moved to within a point of Manchester Storm in eighth spot as the battle for the play-offs took further twists. "Every game is a 'game seven' with play-off implications right to the end so we have to be ready for every one that comes along," said Marquardt. "Beating Coventry after coming from behind was pleasing in a way, but it always seems like we're playing catch up a lot more than we should. "Blaze are well structured and we saw how dangerous they are. We scored then they hit three past us, which was unacceptable and we have to realise we can't switch off. "We're resilient and have come from behind on a few occasions, maybe a little too much, but going into the play-off stretch, we need to clean up in some areas." Fife Flyers started the weekend on a positive note as they took a 5-2 win over Milton Keynes Lightning on Friday. Two from Brett Bulmer and one each from Mike Cazzola, Danick Gauthier and Joe Basaraba set them on their way before they headed to Nottingham Panthers on Sunday. There, it was an overtime 4-3 loss as Gauthier, Basaraba and Evan Bloodoff were all on target, but eventually snuffed out by a Robert Farmer goal for Panthers in the extra period. Glasgow Clan got their first win of the season against Guildford Flames at home on Saturday, winning 5-3 to end a three-game losing run. Guillaume Doucet's brace, along with goals from Rasmus Bjerrum, Vaclav Stupka and Matt Beca proved crucial against a Flames team who have had their number this season. The favour was returned in Surrey on Sunday in a 2-1 overtime defeat as Doucet's strike looked to make the difference, until Jordan Abt equalised, with Ian Watters killing Clan off. Dundee Stars' Fabrizio Ricci's hat-trick on Sunday has taken him to seven points (five goals and two assists) in his last five games. Glasgow Clan's overtime loss in Guildford on Sunday means Pete Russell's side have won only once in their last seven trips on the road. Fife Flyers' three points from the weekend means they've taken seven points from their last five games - two points more than they took in their eight previous games.